Today I am raising an Ebenezer. I am placing a stone, as Samuel did, to mark the place where the battle was won. A stone to mark the place where victory was achieved with the Lord’s help. I’m placing a stone to remind me of God’s faithfulness. A stone to remember those darkest days of sorrow. A stone to acknowledge the power of prayer. 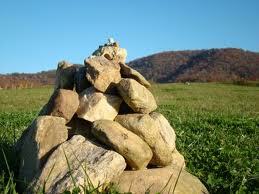 I am placing a stone to express gratitude. A profound thankfulness for a fresh beginning. I am placing a stone because we humans are forgetful. Time passes and the amazing intricacies of what God has done in our lives begin to fade. The details blur and grow fuzzy. We begin to forget that we serve the same amazing God of the bible. A God of miracles. A God of love and mercy. A God who will never leave us nor forsake us. I am placing a stone to mark 2 years of seizure freedom for our beautiful Gabrielle. Then Samuel took a stone and set it between Mizpah and Shen, and named it Ebenezer, saying, “Thus far the LORD has helped us.” —1 Samuel 7:12. I could not possibly express this challenge any better than Charles Spurgeon did below. What has the Lord done in your life?? ?